The Diet DVD and Digital Video is the Diet For Human Beings. 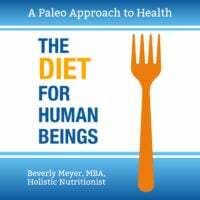 I describe the Paleo Diet, its origins and how to customize it for your needs. The Paleo Diet works for many health issues and I’ll explain why modern grains and starchy carbs damage our intestines and cause Obesity, Diabetes, Celiac Disease, Irritable Bowel, and auto-immune disorders. I have taught this diet for 20 years, even before it was named “Paleo”! Watch the Diet For Human Beings with friends and family so they’ll understand why sugars and starch are OFF the menu! If you’re already eating Paleo, this will expand your knowledge and help you explain it to others. Without reading any books! If you’re new to low-starch/low-sugar eating, you’ll be inspired and informed – and ready to eat the Diet for Human Beings. It’s not hard. I explain what to do, why and how to do it. AND, how to customize the diet for each person’s needs. For more info on the video and a free chapter preview, go here.